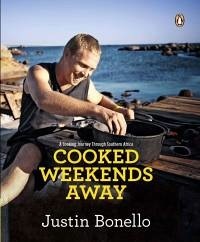 Remember this book… “Cooked in Africa” by Justin Bonello, the ultimate South African Cook Book… well he has written another fabulous book. This time he comes out of the South African Bushveld and heads into the kitchen. You wouldn’t believe which kitchen. Not one but a dozen of the top restaurants around the country, and he tries out a whole range of South African Cuisines.. In each kitchen he learns to cook a couple of their key recipes, he masters techniques, he learns tons of tips and he isn’t shy to pass them on to his readers. One thing about his books is that they are readable. This is not just a book of recipes and restaurant reviews!!! This book is so readable that someone snuck it on holiday, because what better place to read a Justin Bonello cook book than out in the bushveld!!! 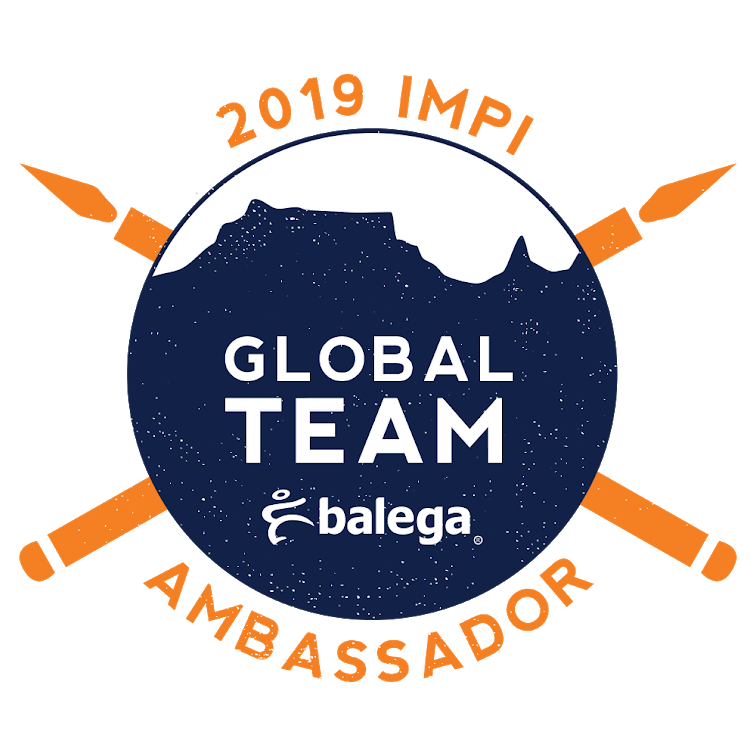 He begins at Magica Roma in Pinelands and I know we will be making a trip there to try it out… then on he goes on to Gold in Cape Town – I have to, have to, have to go there!!! He has a couple of other local restaurants and I am saving for future visits…He even goes on South Africa’s prestigious Blue Train and I know I will never travel on the Blue train but at least I can try out what they eat!!! With each restaurant he visits he learns a new technique, he tries out a couple of recipes and sprinkles a couple of quick tips into them. And just so that you don’t think he has lost his great outdoor cooking skills he rewards his chefs with a meal in the great outdoors and thats where you catch him cooking his own thing. 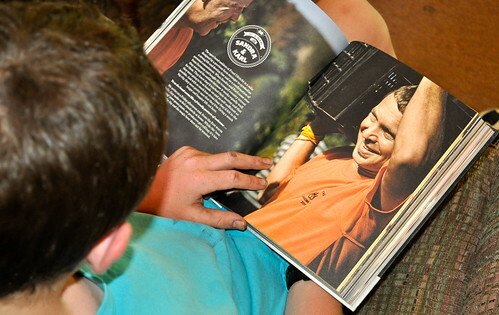 At the end of each chapter he provides “His TakeAway” what he learnt from his trip into that particular kitchen. I love that the recipes are local and the ingredients are ones we can get easily… I love that he uses heaps of herbs and spices that make your meal smell like a South African dream… Seriously this is not one of those celebrity chef cook books that require three and a half cranberries during totally the wrong season, always tricky on the far side of the world!!! 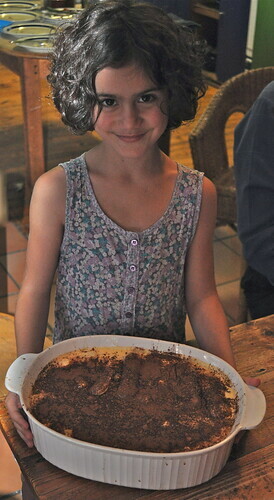 Tiramisu: We passed on the Porchetta, I don’t think I would have many takers for a slow baked piglet at my dinner table – no takers what so ever. But Tiramisu is another story. Now these recipes are not for the fainthearted – he is learning in restaurants after all and he is cooking vast volumes – finally a recipe book where I don’t have to double or treble a recipe to fit our little family!!! 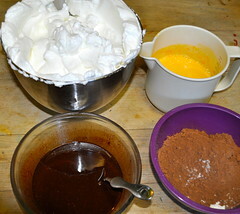 So eighteen egg yolks later and countless finger biscuits… and a spattering of cocoa on top and we were good to go. This vanished except for the little bit I kept for my own personal mid-night feast… I kept it till breakfast the next morning and I can honestly say if you are looking for a very indulgent breakfast… Tiramisu is even better the morning after!!! 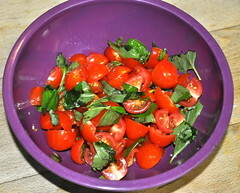 Crudo: Is handfuls of baby tomatoes with fresh basil and oregano leaves, galric and seasoning. 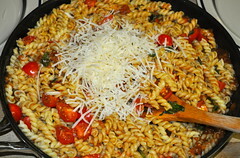 All swirled around in a Napolitano Sauce. 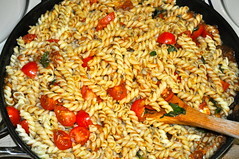 With fresh pasta, that we just never got around to making!!! 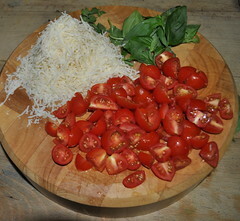 And a heap of parmesan because we all love parmesan and my one or two folk that aren’t wild about tomatoes don’t mind them if there is Parmesan!!! 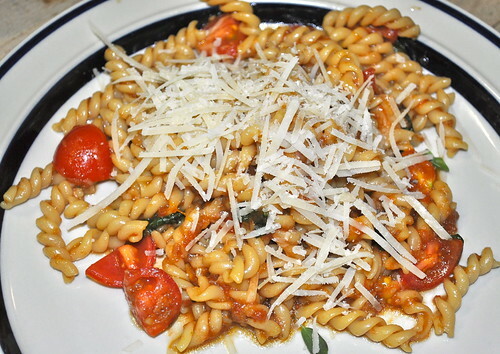 Of course we had to make the Napolitano sauce from scratch and how delicious is that!!! 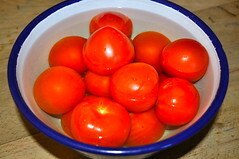 Napolitano Sauce: We make a similar tomato sauce a couple of times a week and I never bother to peel the tomatoes!!! 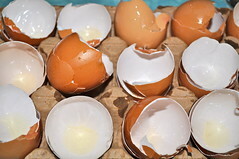 I know how but I am always dashing… but since we were doing restaurant recipes I gave it a try and to be honest it wasn’t that much more effort to peel them!!! Couscous with Dukkah from Gold: We love couscous, it is my “quick I am running so late” or I need and filler at suppertime… or I need an elaborate salad for guests. 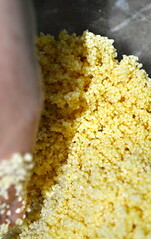 But in this recipe they make the couscous slightly differently and rub the oil into the couscous before you add the hot water. 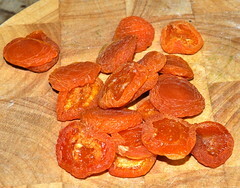 And then added dried apricots, yum and dukkah to the mix. 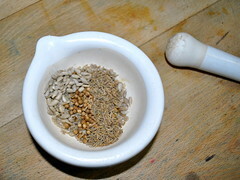 Dukkah: So what is Dukkah – you may as well ask!!! 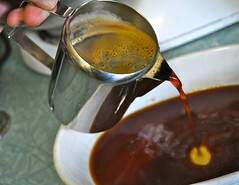 It is a yummy spicy mixture that is used to flavor food. 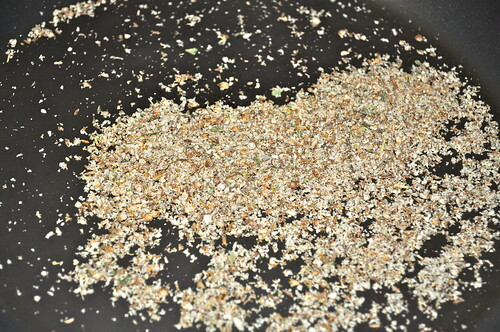 It is made from roast nuts, sesame seeds, coriander and cumin as well as thyme and seasoning. 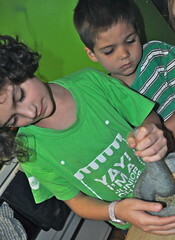 We left out the nuts, we have nut allergies in our house… and out with the pestle and mortar and everybody wanted a turn!!! 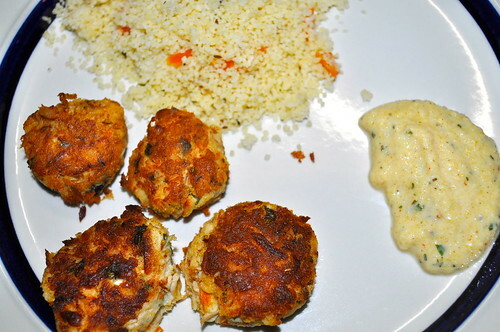 Fish Frikkadels: A frikkadel is the South African version of a meatball or in this case a fish cake. 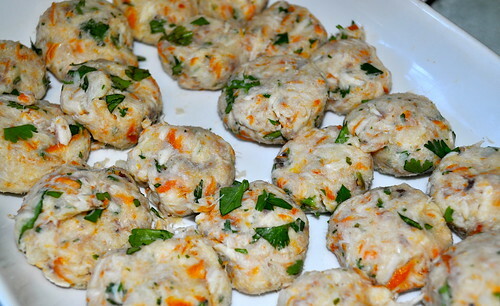 My kids love and adore fish cakes and I knew they would love these!!! 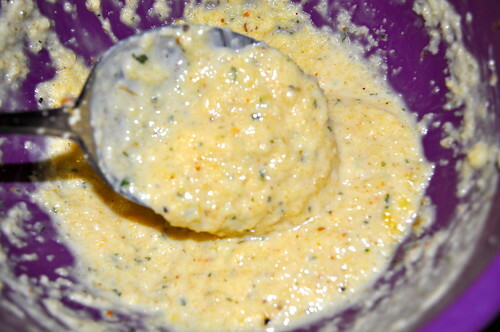 A Couple of mashed potatoes coriander, eggs, lemon juice, and vegetable oil to fry them. Here they are just before they went into the pan and everybody was drooling while they waited. An Apple and mint Raita: Raita is a relish and you can get all sorts of different flavors. An apple raita obviously has apples!!! And it had mint and garlic and masala. 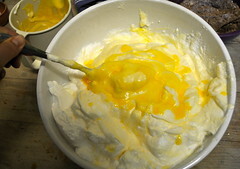 lemon juice and yogurt. Whizz it with a blender and pop it in the fridge to serve cold. This is divine a circus of flavors in your mouth and everybody just quaffed it down!!! Sacher Sponge: So a quick visit to the Table Bay Hotel, who serve a fine high tea and I really wouldn’t mind a visit. Anyway they make a cake that requires a kilogram of Lindt chocolate just to make the ganache to pour over it. Well we had to try this one!!! Now remember I said mass catering quantities and my kids were not sorry about that!!! This cake requires fourteen eggs separated!!! To make this cake you need four bowls. 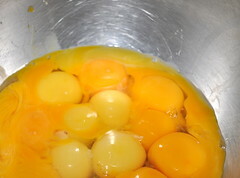 In the first you almost make a merangue with the egg whites and castor sugar, then next bowl had the yolks and some more castor sugar. 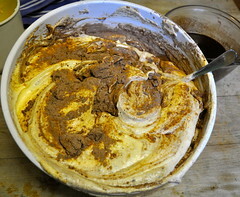 The third bowl had bread flour – and I have never used bread flour to make a cake before… always a first time! 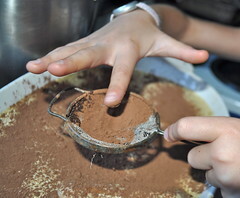 So the third bowl has flour and cocoa (and they used ground almonds – we didn’t because of our nut allergy, we just left them out – rude I know but time was of the essence!!!) 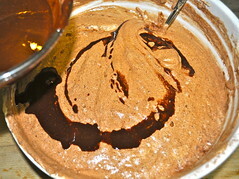 And finally a fourth bowl with chocolate melted with butter in it. Line up your bowls and fold, fold, fold… bake and cool… Well it makes the biggest cake we have ever had!!! And instead of cake tins we used roasting pans!!! No one complained about it!!! 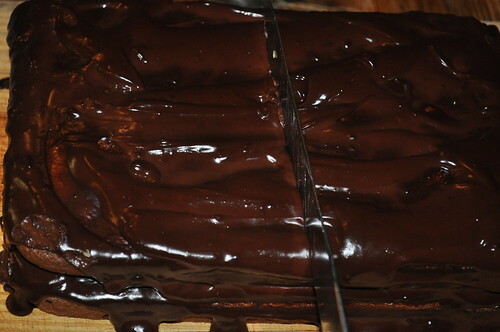 Finally we smothered our cake in a ganache: melted chocolate and cream… and then we simply died and went to heaven!!! So a whole lot of restaurant meals that can be cooked by regular folk and their kids. Not to mention a whole lot of recipes we still want to try. Suddenly we have a whole heap of restaurants we need to visit!!! We are going to have to visit Magica Roma, Gold and The Italian Kitchen in Tokai… I think a number of us could live with High Tea at the Bay hotel. And of all the places we need to go in Cape Town, I think a trip to the Lindt Chocolate Studio, just to have a good look around, has to be right up near the top of the list!!! Actually there isn’t a restaurant in this book we wouldn’t like to visit – they all have their own glorious magic about them!!! And since we are dreaming a trip on the Blue Train would be quite a bit of fun too!!! We highly recommend this book, it is a firm favorite on our kitchen counter- it hasn’t landed on the book shelf yet!!! If you would like to win this fabulous book then go ahead and enter our GiveAway. The GiveAway works in the usual way, comment before the end of this Sunday 19 December 2010, and we will draw and publish the winner next week! – I won’t respond to your comments as I do on our other posts because I don’t want to be included in our own giveaway. Our GiveAway Books are open to everyone: If you have won a GiveAway before never fear – enter away. If you live on the far side of the world – enter away. Postage takes forever from here but eventually it should get to you! 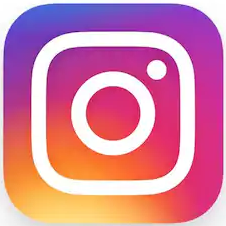 Good luck and get commenting!!! I would like to thank Penguin Books South Africa for a copy of this book to review. Count me in! Sounds wonderful, and my family would love the large quantities, too! Oh, that Tiramisu…oh, oh, oh, now you’ve spoiled my taste buds for the rest of this day. Must. Have.Tiramisu. Thanks for the lovely ‘review’ – always love seeing the Hoods in the kitchen! 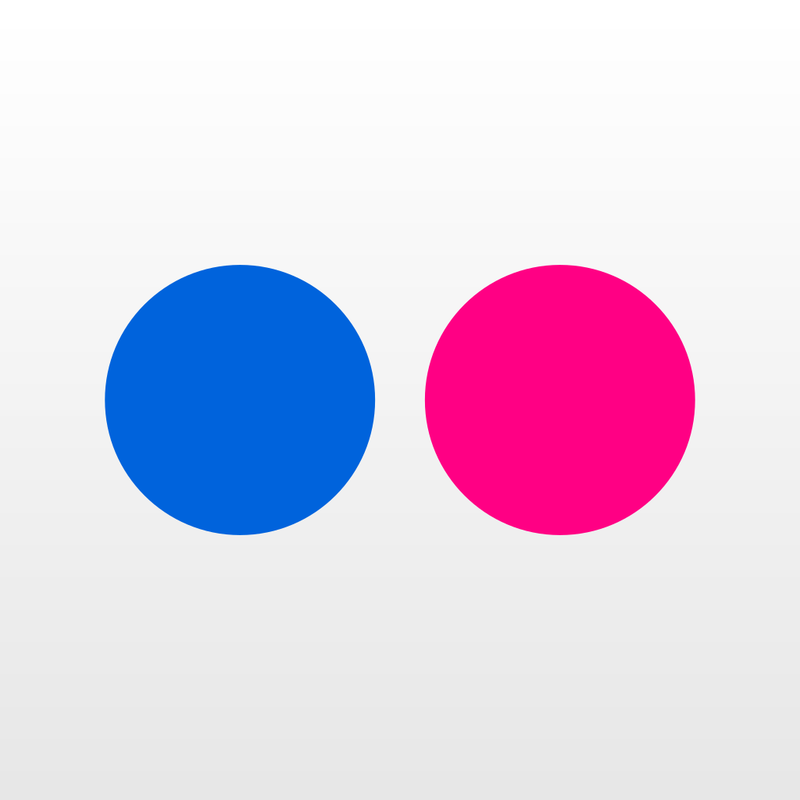 OOOOO……. what a fabulous giveaway. Just in time for Christmas. New recipes. Lovely. Hi love Justin Bonello’s books, I truly do. 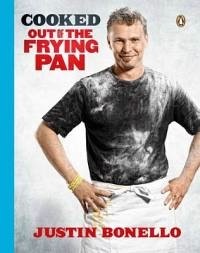 Iwas fortunate enough to meet him at the launch of Cooked out of the Frying Pan a few weeks ago, he is such a nice guy! Genuine and humble. 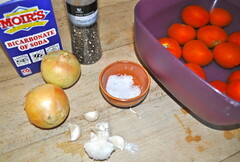 I am also busy doing a series of posts on healthy eating inspired by his new Cooked 5 Series. Oh, yes please. We have 7 to feed a day too. Count me in, the UK needs more South African recipes! My own 9 year old chef would love to add this book to her collection! Oh, I SO want to win this for my dear friend who is missing her warm, sunny Christmas in Jo-berg and stuck here in cold, snowy Upstate New York! Would love to win this book! Count me in! The enormous Lindt chocolate cake looks amazing!I’d love to win this book, and get some cooking inspiration. Hope you are all having a fabulous week. MMMMM. What a lovely book to win…. I’m in!!!!! Yum, yum, and yum! Delish! Everything sounds heavenly! Oh, we would love to win this book! We love trying different recipes! We would love to try out some South African recipes. Thank you for a wonderful review. Now it makes me want the book even more. Already sent hints to the family that I want this book for Christmas. Justin Bonello is my idol. Sounds wonderful! We are also in Cape Town, so now I’m keen to try out those restaurants too!